This is the second week of the month so it is a 'judged' challenge at Tuesday Morning Sketches. Each member of the DT will visit your blog so put your best foot forward......we'll be visiting you. 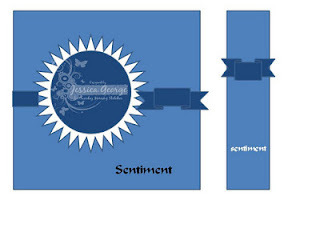 Since today's date is 2-14, the twist for this challenge is to use 2 ribbons, 1 embellishment and 4 layers. Wait till you see the marvelous creations from the DT! The sponsor this week is DRS Designs, who graciously supplied some of the team members with great images. This card was made with one of their images. The image was stamped twice and colored with Copic markers. The second image was fussy cut and layered with foam tape over the first one. The background was lightly stamped with a Hero Arts Envelope Pattern stamp. The sentiment from Flourishes was embossed with gold embossing powder, ovals are Nesties, the die cut strip of butterflies is from Memory Box, the butterfly charm is from Fire Mountain Gems and the ribbon and pearls are from Michaels. Stickles were used for a little "Bling"! Some members of the DT made 'scraplings' with their card...check them out! What a great idea! This is the lovely sketch, from Jessica, that was used for inspiration. Go get your papers and start designing.......I'll be visiting and I can't wait to see your creations. Beautiful card! 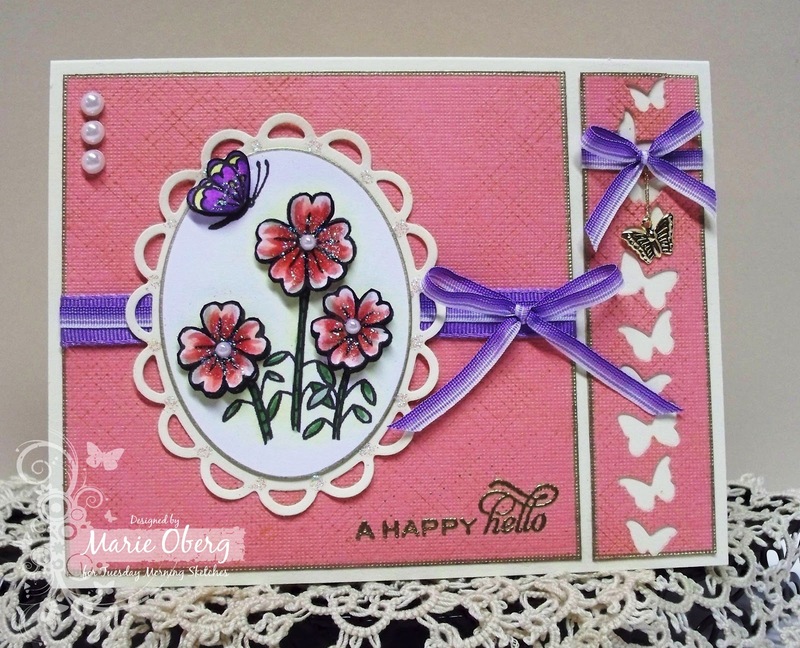 The flowers are colored stunningly and love the butterfly punched border and charm!! This is gorgeous Marie. Love the butterfly die cut panel and charm, beautiful! The layered fussy cut image really adds dimension, too. Question for you, do you really have a butterfly garden? My mom always wanted to plant butterfly bushes, but never did. Your card is just gorgeous!! Love the butterflies. Beautiful flowers and coloring. Fabulous!! Gorgeous card Marie! Love your sweet style. The butterfly border is so pretty too! This is so fresh and pretty...love how you have carried the butterfly theme throughout! Oh, I love butterflies and they are so pretty along the side! A beautiful card, Marie...great job! Love this - you have such a way with flowers. Black & White & Splash!